George Cantrill, centre, not only scores goals, but offers Guiseley a new defensive dimension. Picture: Simon Bellis/Sportimage. That is the message from Guiseley co-manager Russ O’Neill, who is urging the Lions to carry on from where they left off in Saturday’s strong second-half showing against Stockport County in tonight’s National League North encounter at AFC Telford United. 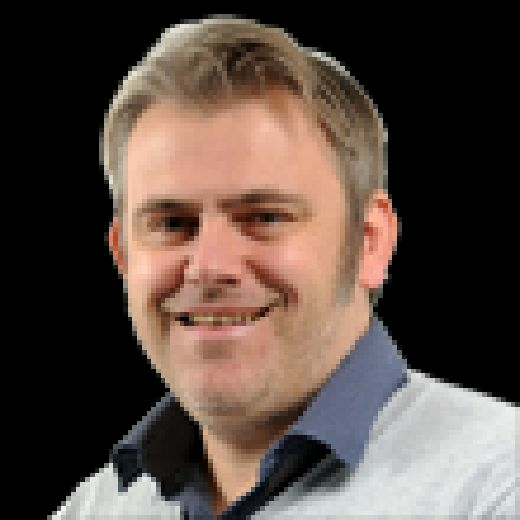 Guiseley showed spirit aplenty to turn around an interval deficit against the promotion-seeking Hatters to take a point in a 1-1 Nethermoor draw and, while the result extended the club’s winless league streak to seven matches, O’Neill insists that the Lions can take away plenty of positives. O’Neill, whose side are still waiting for their first league win of 2019 and hold a five-point buffer over the relegation zone, said: “We created quite a few chances against a real top team (on Saturday) and they are probably the best club in the division with the biggest crowds. “We have just to go again on Tuesday in another tough game against Telford and they will be looking to put right their defeat on Saturday. Kennedy Digie. Picture: Guiseley AFC. 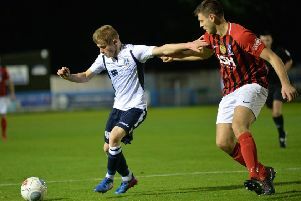 A second-half strike from Sheffield United loanee George Cantrill earned Guiseley a share of the spoils against second-placed County, with the youngster also producing an alert performance in the defensive realm, much to the delight of O’Neill, who believes that he has a bright future in the game. He said: “George is a young player who is very versatile and sometimes, when you are that versatile, it can go against you because you never really seem to nail a position down. 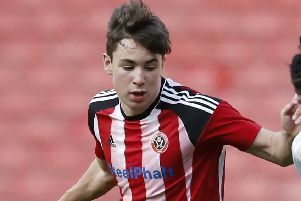 “But Sheffield United have sent him here – and have been really good with us – to play some men’s football and learn this level and we have seen him push further forward and play with great energy. Farsley Celtic manager, Adam Lakeland. Picture: Farsley Celtic FC. One downside to Saturday saw new signing Kennedy Digie, who suffered a dead leg in his first training session with the club on Thursday, come off in the second half after aggravating a problem – and he will be monitored ahead of tonight’s game in Shropshire. O’Neill said: “He trained with us on Thursday and to be fair, he got a bit of a whack. “He has not played a lot of football. We played him at centre-half, but he can also play further forward and play as an ‘eight’ and play box to box and adds a real presence to us and power and athleticism as we move forward. Adam Lakeland’s promotion-chasing Farsley Celtic side make the trip to sixth-placed Gainsborough Trinity in a key Evo-Stik League Premier Division fixture this evening. In the East Division, Tadcaster welcome Sheffield FC.